From Domenico Starnone, the Strega-prize winning author of Ties (2017), a stylish metaphysical novel about the art of teaching, the fear of terrorism, the sinuous paths that self-delusion lead us down, and the travails of growing old. Mild-mannered retired teacher Domenico Stasi learns that Nina, a former student of his, is being held as a suspected terrorist. His first thought is to contact her–only her innocence can reassure him that his teachings have not contributed to the creation of a monster. But instead of the comforting proclamations of innocence Stasi was hoping to hear, Nina coolly alludes to her guilt. She then entrusts him with a simple task that soon turns deadly serious. A lethal game has now been put into play and nothing can stop its course. Yet matters may not be entirely as they appear. Into the story steps Domenico Starnone–author, retired teacher himself, character in his own fictional world–and First Execution becomes an exhilarating voyage to that murky terrain where fiction and real life mix. Central to this novel is one of history's most enduring philosophical dilemmas: to what extent do we bear the responsibility for actions taken or not taken? Domenico Starnone will discover through his encounter with Domenico Stasi that even a lifetime of commitment to firm principles cannot provide an unassailable answer to this question, nor can it appease a man's guilty conscience. Indeed, in this electrifying literary novel, only one thing appears certain: no one is innocent. Domenico Starnone was born in Naples in 1943 and now lives in Rome. He is the author of eight novels and numerous books of non-fiction. In 2001, he was the recipient of italy's most prestigious literary prize the Strega. Antony Shugaar's translations for Europa Editions include For Grace Recieved by Valeria Parrella, Everybody's Right by Paolo Sorrentino, Fabio Bartolomei's Alfa Romeo 1300 and Other Miracles, and Margherita Dolce Vita by Stefano Benni. "...one of the best short books you'll find this year." "A complex novel on the themes of liberty, choice and destiny." "First Execution is a book about terrorism. At least it seems that way at first, but this first impression is erroneous. it narrates the difficulty of writing a book on terrorism." "From his earliest books, Starnone's literary point of reference has been Pirandello. His books are theatres of action, both physical and psycholgical action." 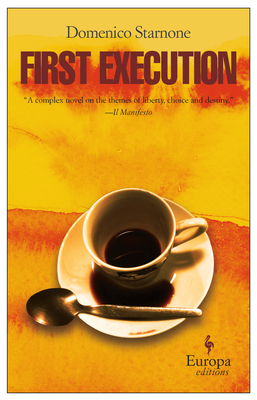 "First Execution could certainly be defined a 'political novel'. There's that too. But it is, moreover, a reflection on the fine line separating innocence and guilt, on the transmission of knowledge, on memory, on the value of schooling, on the relationship between generations."